Our most popular and convenient spa gift card option, Spa Habitat’s Instant Spa Gift Certificates are available in any dollar amount and can be printed or emailed directly to the recipient. Simply choose a design, amount, recipient name, and a personalized message, and send or print instantly. Visit any of our convenient Dallas-area locations to purchase a physical gift card in any dollar amount. Pick up a beautiful fabric gift card pocket to improve your gift presentation, or add a unique organic spa gift to complement your gift card. 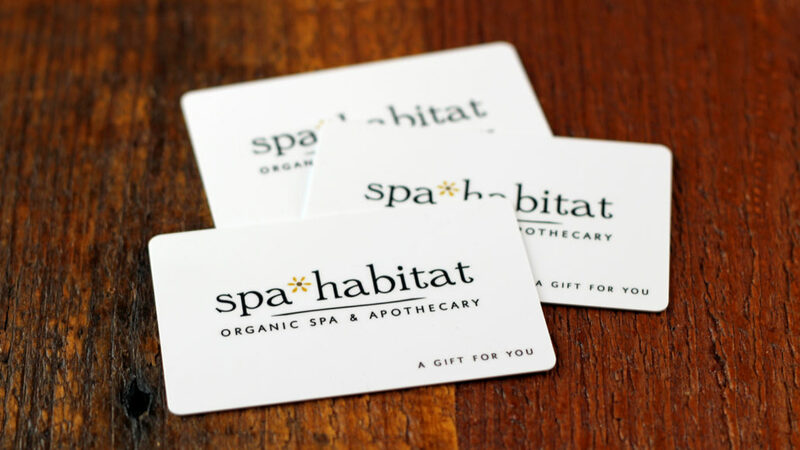 Spa Habitat Gift Cards may be redeemed at any Spa Habitat location for spa services, products, taxes and gratuities. They do not expire and have no dormancy fees. They are also non-refundable and are treated “as cash”. The holder of each gift card is the owner, including digital gift certificates. Please keep them in a secure place until their redemption.